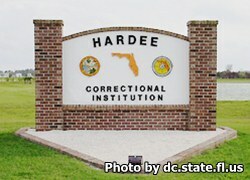 Hardee Correctional Institution is located in Bowling Green Florida. It is a level VI facility that houses about 1,540 adult male inmates of varying custody levels. Many services are offered through the Chaplaincy Service at this facility. Inmates can also take part of programs aimed to advance their own self well being, including parenting, and business classes, financial planning and investing courses, and alcoholics and narcotics anonymous programs. Inmates who are incarcerated at Hardee Correctional Institution can participate in academic courses that include earning a GED, adult basic education and assisting other inmates in learning through an assistants program. Carpentry is one of the vocational skills offered that gives inmates a skill they can use to be employed after they are released. Before you visit your inmate you must have an approved visitation application on file for visiting that inmate. Visiting is on Saturdays and Sundays from 9am-3pm. You can register for visiting at the institution as early as 8:15am, but no later than 2pm. If you arrive after 2pm you will not be allowed to enter into visitation.